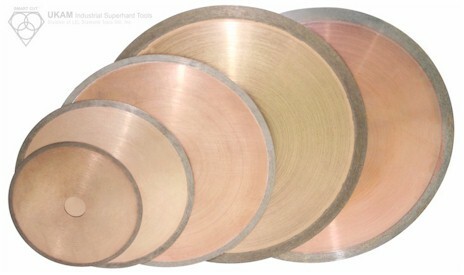 Diamond Wafering Blades, cross sectioning, failure analysis. UKAM Industrial Superhard Tools is the LEADING Manufacturer of Precision Diamond Wafering Blades with SMART CUT technology in US. Used on all popular low and high speed Sectioning/Wafering saws such as: BUEHLER, STRUERS, LECO,& many others. Price & Quality Guarantee: we will beat & match any competitors price for the same type and quality diamond wafering blades. Save up to 650% WHY PAY MORE? Need it today? No problem. With over 4,000 diamond wafering blades in stock in different diameters and specifications, you are sure to find the solution you are looking for in stock and ready for same day delivery. UKAM Industrial Superhard Tools. is quickly becoming one of the leading and most reliable manufacturers of THE TOTAL DIAMOND WAFERING AND SLICING SOLUTION. We work together in reducing your costs. Take advantage of manufacturers direct prices today! On average, you can save 400% to 650%. If you are not using one of our products, chances are you are paying to much. THE RESULT series Precision Diamond Wafering Blades offer you real value and savings. On the average, when you factor in savings in blade life, price, time, and material. You will find blade manufactured with SMART CUT technology can improve and reduce costs of your cross sectioning by as much as 600%. UKAM Industrial Superhard Tools has over 50 years of experience in manufacturing, research, and development of new and advanced technologies to keep up with the ever increasing challenges provided by advanced materials. We are committed to helping you improve and optimize your cutting and wafering operation to the outmost level of efficiency. If you have a special application, that requires a custom solution. Send us a piece of your material, and we will analyze it in our laboratory and design a bond formulation for your particular requirement. 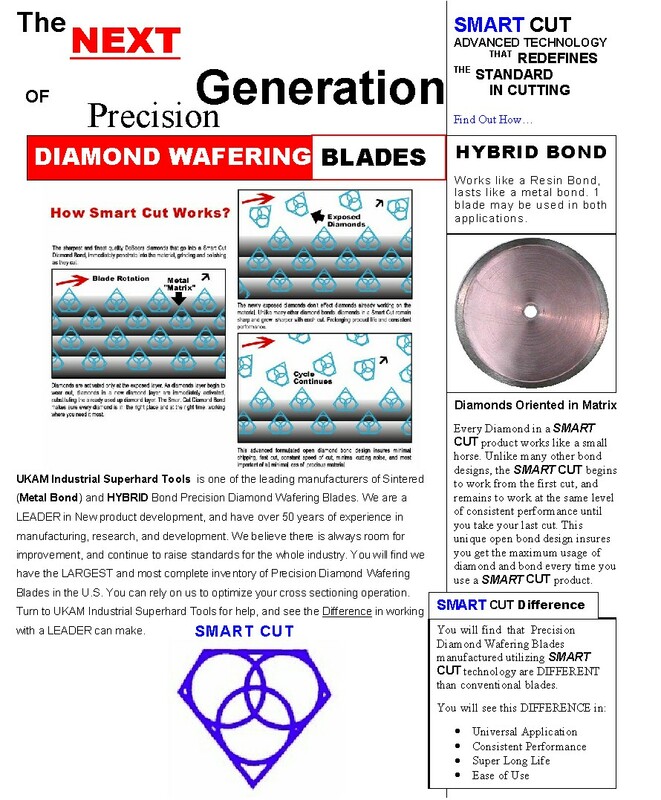 UKAM Industrial Superhard Tools, Division of LEL Diamond Tools International, Inc. has recently introduced SMART CUT technology, a new breakthrough in manufacturing precision diamond wafering blades. The company maintains this technology will REDEFINE the standard in cutting. This technology has also allowed us to develop a NEW GENERATION HYBRID BOND diamond bond matrix. In a SMART CUT diamond bond you will find all the advantages of cutting speed and smoothness that you have come to expect in a resin bond, and unique characteristics of a metal bond in terms of life, aggressiveness, durability, and excellent performance on you look for in a metal bond. maximum cutting performance – each diamond works like a small horse. Diamonds come in contact with the material in the right place and at the right time, working where you need them most. You get the maximum use out of diamond and bond. faster cutting action - Diamond wafering blades manufactured utilizing this technology are much more aggressive than your conventional blades. They cut faster, still leaving behind a smooth finish. more universal - These diamond blades are designed to work on practically any material you can find, You can cut very hard materials, than switch to cutting soft materials and the blade will still maintain the same consistent performance.